If someone ever asks about my favorite spot in Madrid, the one and only, this is it. There are so many reasons to enjoy the park that one visit to walk around is not enough, you will come back for sure. 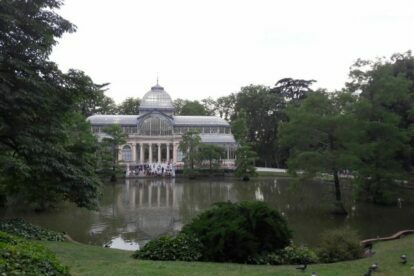 I believe, actually, that Retiro is something locals enjoy even more than visitors. The landscape is spectacular every day, especially during autumn when beautiful colors invade the skyline. There are rose gardens, monuments, lakes and all kinds of flowers. For those of you who enjoy cultural events take note: my favorite book fair is held at Retiro every year. Private and temporary exhibitions are presented at the many buildings inside, and with the new library (check the Biblioteca El Retiro article) the cultural events are growing even more. If you are a sports lover, then read on. Yoga classes, rollerblading and cycling exhibitions and classes, and also basketball, soccer or tennis competitions. It can all happen on any given weekend. If you are more into picnics, bike rides, long walks or jogging then of course Retiro is the perfect spot too. There is also a lake in which you can take a boat ride, and puppet shows or street performers all around the park. Madrid has a rather dry climate all year long, so a park filled with trees and green areas is a refreshing and healthy option that everyone will enjoy.